Pressing the Esc key or left-clicking on the top of any gameplay screen will bring up the VCR menu. 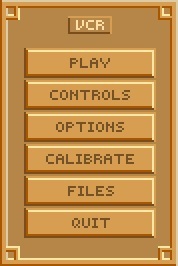 This is the main menu from which all others are accessed. 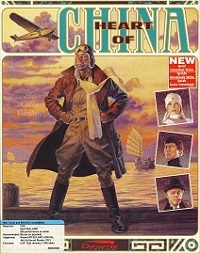 In Heart of China you will play as Lucky, Chi or Kate. Often they work alone or in pairs, never with three of them simultaneously. When they are in a pair, you can chose which character to play. This is important because each character has his own abilities. For instance while Lucky does most of the talking, Chi will have to take over when the other person only speaks Mandarin. The game screen displays two character portraits: in the bottom-right corner is the portrait of the active character, the character you currently play as. 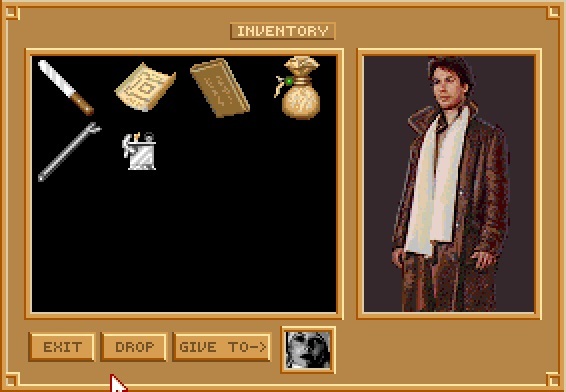 In the bottom-left corner is the character portrait of the passive character, your companion, if any. To switch character, simply left-click the character portrait of the passive character in the bottom-left corner of the game screen - you will notice the character portraits will swap positions. Note that each character in the game has their own inventory window and own inventory items, which they can exchange with each other (see inventory and use of items below). - Exit cursor: Left-click to enter another room/area. Note that the exit cursor itself points at a certain direction, which is useful when there are multiple closely-placed exits in a screen. - Hand icon: in some situations the cursor will change to a hand icon. The character can then engage in hand-to-hand contact wit the item on screen. - Shooting the gun: in Jake's inventory screen, use the gun on him for him to hold it in his hand. Then, in the game screen, right-click and hold the mouse button to display a crosshair. While still holding the right mouse button, left-click to shoot. - Shaolin healing touch: as Chi, in the game screen, right-click and hold the mouse button to display a hand-icon. While still holding the right mouse button, left-click to apply the Shaolin healing touch (used to heal people). Each character has its own inventory items and sometimes it's important to give items to another character. In order to do so, select the item and click the "give to" button. To use an item in the game screen, you first have to drop it from the inventory screen to the game screen. To do so, select the item and click the drop button - the item will appear in the bottom-left corner of the game screen. To use the item in the game screen, left-click it, hold it, and drag the item to the person or item you would like to use it on. Some items can also be used or manipulated by the character himself in the inventory screen. For example to make Chi wear his ninja outfit, click and drag the ninja outfit from his inventory items to his character (in the main inventory screen) - you will see the portrait of Chi change as a result. Some inventory items can also be combined with each other. For example to create a grappling hook, hold and drag the hook in inventory to the rope in inventory (or vice versa) and a grappling hook will automatically be created and placed in inventory. One of the most unique elements of Heart of China is the multiple ways in which you can proceed through game play. These multiple plot paths are present because the storyline of Heart of China is not linear in design. there are often several ways to proceed into the story when faced with a puzzle or obstacle. Your actions affect the flow and direction of the adventure. there are several different endings to the story. The ending that you experience, and the paths you take to reach that ending, are completely dependent upon the actions and decisions that you make throughout the game. 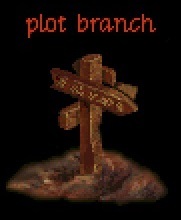 Because of the numerous options that plot paths present, you'll be notified by a plot branch alert when you've chosen a path that could have been approached in a different way without providing any spoilers or suggestions whether you picked the best path. Some plot branches way lead to a dead end, so save often and a lot. Your actions and choices will not only determine the physical flow of the storyline but the relationship between Kate Lomax and Jake "Lucky" Masters. To see how you're doing in the romance department, you can access a Romance Meter (a small heart in the lower left-hand corner of the screen during flight sequences) which displays a cut scene on Kate's current feelings towards Lucky. There are three stages to the meter: passionate, neutral and cold. At the end of the game, the final stage of the romance meter, along with Lucky's business relation with E.A. Lomax will determine the ending of the game. In Heart of China, time is an ever-present companion. Even when the character doesn't do anything at all, time still progresses. This can sometimes be fatal. for instance in Kathmandu, you only have one day to get the collaboration of the villagers, or a storm will blow the Yankee Eagle down from the edge of the cliff: game over. you also have little time to rescue Kate from Li Deng before the fortress guards catch up with you, and so on. Also, each day that Lucky delays in rescuing Kate he loses $20,000. there are many ways to lose an entire day - try to avoid losing time as much as possible. You can entirely pause time by pressing Escape, displaying the game menu. 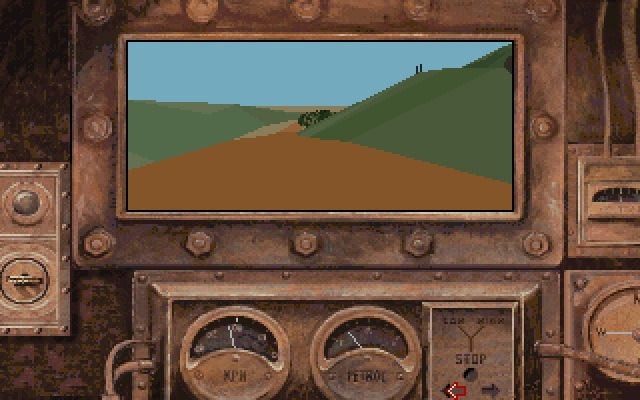 There are two arcade sequences in the game: driving a tank and a sword-fight atop a moving train. You can chose to play them or skip them (as a winner). You can also change the difficulty setting of the arcade sequences in the options menu. See the game walkthrough on more details of the sequences.